Jonathon Bender killed himself in 1999. Before making the decision to end his life he had gone to great pains to understand and document it. I don’t know why I was so sick when I was a baby or why I cried so much, but I don’t think that I ever wanted you to put me down in my crib. I couldn’t get out by myself and I couldn’t tell if you were going to come back for me. I think I kept crying so that you wouldn’t leave me alone. Could you hear me? ‘Dear Everybody’ is a collection of unsent letters, cuttings, records of conversations and other assorted materials that his younger brother Robert has edited into a compelling account of an unfolding tragedy as he also seeks to understand his brother’s life and death. Stories of families, love and death seem to be Michael Kimball’s stock-in-trade. I say ‘seem’ because I haven’t read his first two novels but these themes are evident on the neat and contained website that details his work to date. ‘Neat and contained’ was likewise my first impression when I was handed this remarkable novel. It won’t be the longest book you’ll read this year but it will be one of the most memorable, both in style and content. Jonathon’s life is set out as a diary; sometimes a page may only contain a few notes, on other occasions it might be a newspaper cutting or lines from a transcribed interview. For me this worked beautifully, creating a sense that what I was holding was not a work of fiction at all, rather a ‘found manuscript’. It also meant that the whole book was readable in no more than a couple of evenings. This may not be to everybody’s taste, both in length and approach; it may take the reader a while to appreciate just what Michael has done here but this is most definitely a book that should not be abandoned after a few pages merely because it doesn’t fit expectations of what is a novel. That this book is a quiet tour de force is testament to the skill by which Michael brings us the events, significant and trivial, that collectively created Jonathon’s life and death. There is humour and horror here and for me, moments when I was uplifted, others when I despaired, wanting desperately for the book to have another ending. But real lives don’t always have happy endings and I was struck by quite how true to life this story felt. I am, in a small way, a therapist and I have had stories not unlike this told to me before. They are hard to listen to and make no mistake; this is a hard book to read in places. I have no shame in saying that I was angered, heartbroken and deeply moved by the people Jonathon met, lived with and loved. On more than one occasion I cried, not just for Jonathon but for a world where through misunderstanding, fear, disinterest and downright nastiness, lives like Jonathon’s will be lived over and over again. But there is joy here too and a message that underpins everything, that we are shaped by others and we in turn shape them. Writing a novel with a moral centre without being ‘preachy’ is not easy. Michael Kimball deserves great praise. Oh, and I said earlier that this was the first of Michael’s books I’ve read. It will not be the last. 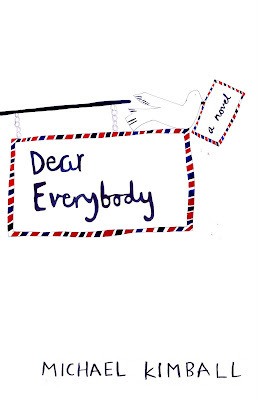 Read Michael's Kimball's article at the magazine about writing Dear Everybody here.